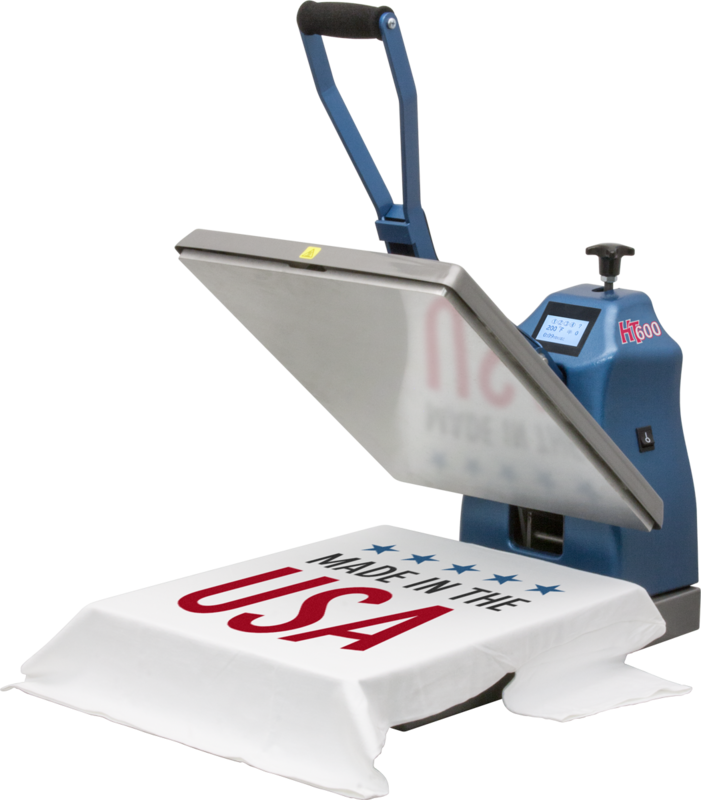 The HIX HT-600 Clamshell Press ensures that your larger heat transfer impressions are perfect from edge to edge. 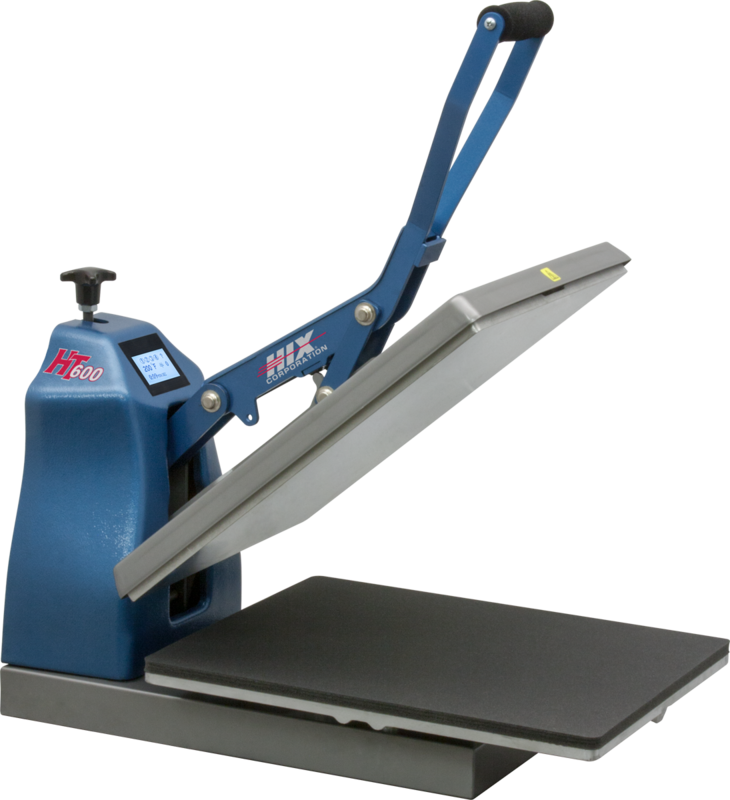 With a larger 16” x 20” platen surface, you’ll be capable of handing those transfers that require more surface area. 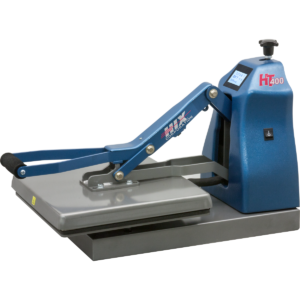 Built with the same features and performance characteristics as the HT-400, the HT-600 has an increased heat platen (16″x20″) that can apply even pressure on all types of transfers, even on items up to ½-inch thick. The floating lower platen helps provide even pressure on thicker items, no matter were it’s applied. The HT-600 drives the industry in the manual heat presses for its ruggedness, durability, and years of trouble-free performance. There is no better press that will handle the production demands and provide the coverage quality like the HT-600. The HT-600 features a touch-screen controller with a digital timer. It is adjustable up to 999 seconds, shows time countdown on readout, beeps after elapsed time, and resets when the handle is raised. The calibrated digital temperature control is adjustable up to 450°F (232°C) and displays the current temperature. The easy to use open and close handle has spring assist and a full-range pressure adjustment. It provides even pressure on thicker items and adds 20% more pressure over straight handle designs. 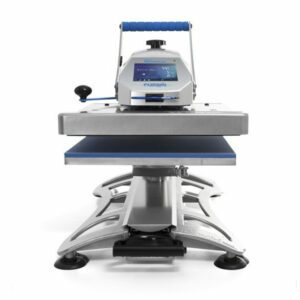 The HT-600 now comes with a free Splitter Stand (as pictured above), allowing for the operators to “dress” the shirt easily over the lower platen, keeping the back of the shirt positioned underneath the machine and away from the heat and compression. This is handy when trying to avoid double-compression and heating of a previously applied transfer on the same shirt. In case of sublimation ink, it will also avoid all ink migration to the back side of the shirt. The HT-600 is ETL certified. It has a limited 1-year warranty and a lifetime warranty on the heating element. Easy integrated digital time and temperature settings – Touch-screen controller access allows simple dialing in of time and temperature. From the touch-screen controller, preset selections of temperature-time combinations can be easily programmed into the machine. The current pressure is displayed on the touch-screen display each time the press closes. The pressure is easily changed with the black pressure dial on the face of the control housing (clockwise for more, counter-clockwise for less). There are nine settings: 0-3 for light pressure, 4-6 for medium, and 7-9 for heavy. This is a great feature if you press a lot of different thicknesses. 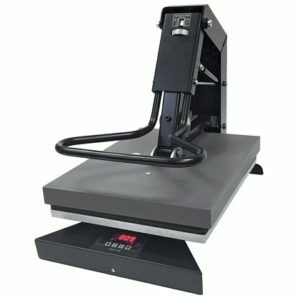 Tilting (floating) lower platen – The bottom platen tilts up towards the upper platen as the heat press closes. This equalizes pressure even when pressing thick items, like a quarter-inch thick 8×10” ceramic tile. 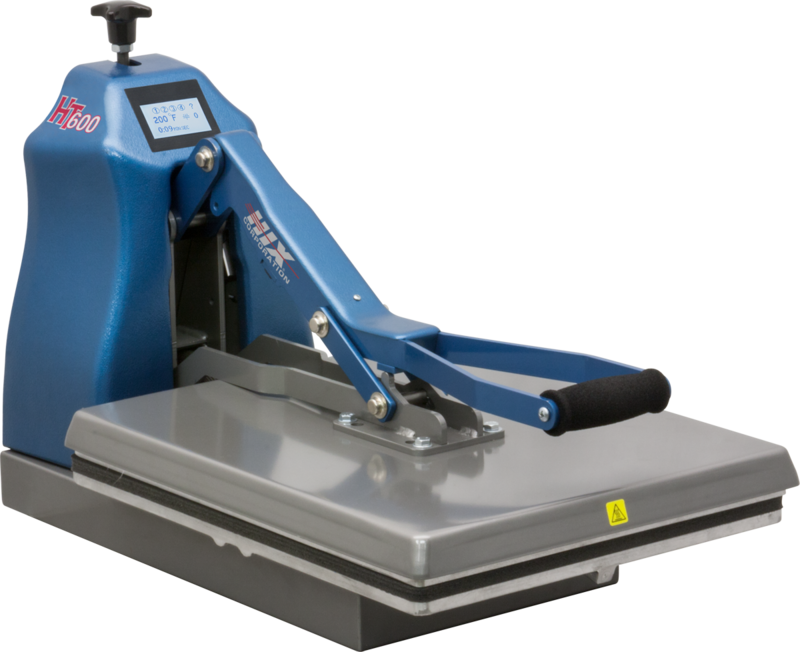 Top Pressure Plate- The handle attaches to a 4″x5″ pressure plate on the top platen instead of a single screw going into the top platen. This provides more even pressure on the outside edges of the press (think of it as pushing down with your entire hand, versus just your thumb). Certified electrically safe (ETL) – The “Electrical Testing Laboratory” seal means HIX presses have passed a rigid and very demanding independent testing process, and have been certified electrically safe. 100% Made in the USA – HIX has its own 11,000 sq ft manufacturing facility with its very own fully integrated aluminum foundry, CNC mill operation, welding, metal forming, wiring, fabrication, assembly, and packaging departments. A one-year general warranty and lifetime warranty on the heater element. 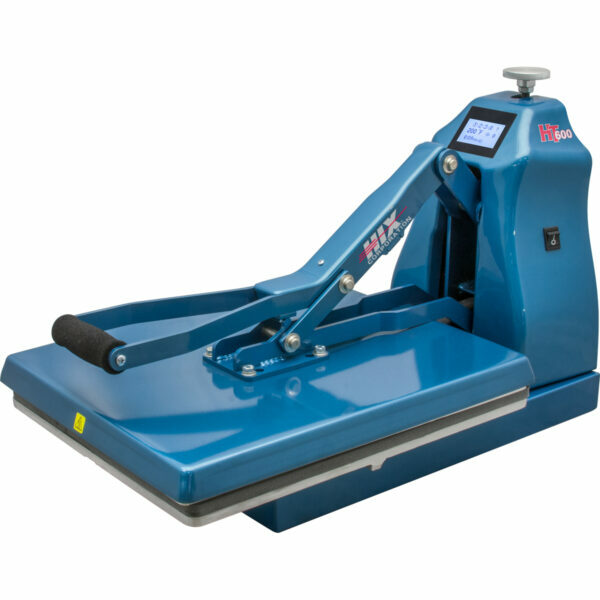 The HIX HT-600 Clamshell Press Heat Transfer Machine is available by special order only. If you’d like to order please contact us by filling out the form below or by calling us at 841-7683.